I had been wanting to do another larger painting in chiaroscuro where the objects are emerging from darkness and shadows. This composition is a pineapple with an inlaid wooden bowl and four mangoes. 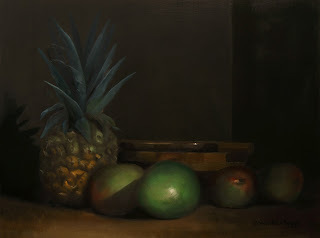 I had used mangoes in a smaller painting a week or so ago and I really liked the color of them. So this painting is about the shadows and light, and the overall greenish-brown tone in most of the painting. I hope that you enjoy it!